Download our latest Parish Weekly Newsletter. Please see the Noticeboard and our News & Events page for further information. Need local Mass Location and Times in England & Wales? Need a Mass Leaflet in English? Do you know someone, who is sick or in Hospital? Do you think the Parish may be able to help you? Do you think you may be able to help the Parish? Alternatively, try our Parish Groups page for information. All are welcome at this Mass for Youth, especially the young but all others who wish to encourage and pray for our young people. It should be a great celebration and there will be refreshments afterwards. Please do attend and show our “Hope in the Future” in our young people. The Catholic Youth Ministry Federation (CYMFed) seeks to help shape and support Catholic Youth Ministry in England & Wales. · developing and strengthening the direction of Catholic youth ministry. The parish is still in need of a Youth Representative (aged 18 – 25), this involves attending Diocesan gatherings to represent St Vincent’s. If interested please contact Father Paul. There will be a Youth Pilgrimage to Rome in February 2019. It will be led by Bishop John and will take place from 16th February until 23rd February. The pilgrimage is available for over 18s. 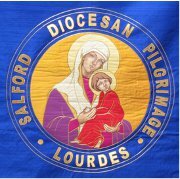 The cost of the pilgrimage is £690 and this includes flights, full board accommodation and insurance. Are you (or is your child or grandchild) between 16 and 24? Are you thinking about helping at Lourdes or going abroad to help with a Charity? Did you know that each year the Catenian Association, through the Catenian Bursary Fund gives cash grants (nothing to repay) totalling over £100,000 to young Catholics to help with their expenses? If you would like more information please pick up a leaflet at the back of church. To see the few simple criteria and the wide range of projects we support and/or download an application form from www.thecatenians.com/bursary . There are leaflets at the back of church giving information about the Catenian Association. Local contacts are Graham Sivills 868697, Brian Lillis 658543. A new young adults group (18+) has been established to provide young adults with an informal, but structured environment in which to discern, ‘what are you looking for?’ The searchers group has been set up to help young adults to develop their prayer life, learn more about their Faith, reflect on what God is asking of them and to socialise with people of similar ages. Every month there is a special celebration at the Cathedral for young adult Catholics, called “ReIgnite”. It takes the form of Mass on the third Sunday of each month in the Cathedral at 5.30 p.m., at which young Catholics will read and provide music, followed by a social in a nearby pub with a guest speaker. Please spread the word and make sure our young Catholics know that the invitation is for everyone! This is an initiative which saw its beginnings in World Youth Day 2005; it is essentially very simple - open our churches as a place of prayer, and invite anyone to come inside. 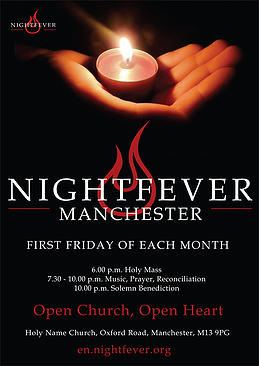 Nightfever evenings take place in Churches throughout the world - many in Germany, but also New York, Dublin, London and now Manchester too! Time : 7.30 p.m. - 10.00 p.m. This is an opportunity for anyone and everyone to visit Church for a peaceful and uplifting atmosphere of music and prayer. Further information and contact details are on their website HERE. Do have a look. With concerts at the Barbican and Lloyds of London, this is a very impressive project. The diocese is blessed to have been able to take an official "under-16s" group with the annual pilgrimage to Lourdes for the first time this year. The group were very much part of the wider pilgrimage, taking part in all the liturgies, visits and processions, yet having their own identity as a group. It is part of the long tradition that many young people play a large part in assisting the infirm throughout the pilgrimage and especially at the Grotto to Our Lady. More information on the Diocesan website.